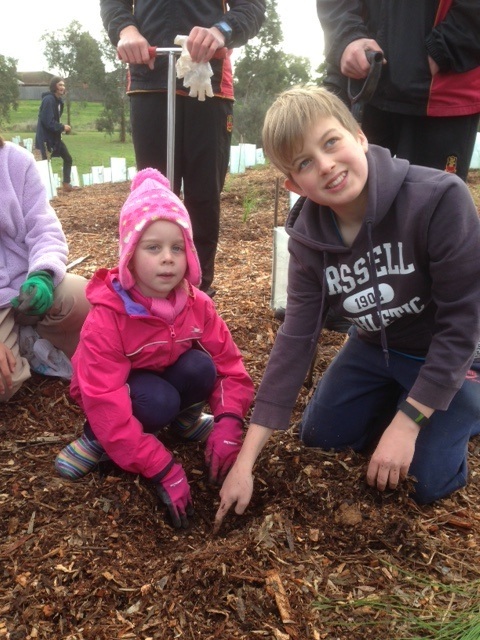 On Tuesday, July 28, 43 Yr11 Environmental Science students, Sustainability leaders and volunteers from year 7 to 11, joined forces with 105 Prep to Grade 2 Grovedale Primary students to plant native grasses (provided by the Greater city of Geelong) along the embankment of the Waurn Ponds Creek as part of the Planet Ark’s, National Tree day activities. The tree planting exercise, provided our students a wonderful opportunity to showcase and develop their leadership skills as they assisted and mentored the Primary students. Collectively the students planted over 1200 grasses in one hour, which was an absolutely fabulous outcome. We would like to thank Colin and Rhonda Kelly, (founding members of the Friends of Waurn Ponds Creek), for fostering our ongoing networking with their group and for their wonderful organisation and support of the day. We would also like to acknowledge Tony Veitenheimer (Buildscape services) and other volunteers for the preparation of the site and assistance with the planting on the day.